You get all these shown in the photos included! Mortal Kombat. Ultimate Marvel Vs. Capcom 3. Complete with cases. UMVC3 played briefly once and MK hasn’t been played. PS Vita Game lot 7 Pre owned PlayStation Vita Games- COD, Final Fantasy, More! Rabi-Ribi Lot - PS Vita Game, Soundtrack, 6 Trading Cards - Limited Run Games. Condition is Brand New from smoke free environment. Shipped with USPS First Class. Injustice Ultimate Edition. Farming Simulator 18. 6 MLB THE SHOW 12 (Sony PlayStation Vita) UPC: 711719220008. 2 MLB THE SHOW 14 (Sony PlayStation Vita) UPC: 711719221746. LORD OF THE RING. (SPECIAL PRICE). SPECIAL PRICE ! The object for sale is ONE item (unless otherwise indicated). 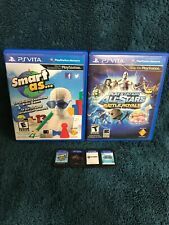 Ps Vita Game Lot. Condition is Good. Resistance Burning Skies, Zero Time Dilemma, Tearaway, And Assassins Creed 3 Liberation all with original cases. Also included One Piece Unlimited World Red in a GameStop case. All games were tested and working. Danganronpa Another Episode: Ultra Despair Girls. Dangaronpa Trigger Happy Havoc. Dangaronpa 2 Goodbye Despair. The object for sale is ONE item (unless otherwise indicated). PlayStation PS Vita Game Lot - ModNation Racers, Reality Fighters, Deviants. Condition is Very Good. Shipped with USPS First Class Package. PS Vita Collection with 8 Games, 64 GB Sony Memory Card and Storage Case. All in like new condition. NEED FOR SPEED - MOST WANTED. Condition is Acceptable. RESTRICTIONS APPLY. Special services cost extra. They have all been tested. RESTRICTIONS APPLY. Any included codes are being sold as used unless it is stated otherwise. Special services cost extra. They have all been tested. Ps Vita Lot. Condition is Like New. Shipped with USPS First Class Package. Rainbow Skies - Complete with manual. Rainbow Moon - Complete with manual. Art slip has a tear. These will never be released again. Condition is Very Good. ~~~~~~~~~~~~~~~~~~~~~~~~~~~~~~~~~~~~~~~~~~~~~~~~~~~~~~~~~~~. Mostly RPG titles. Many of these titles weren’t even released in the U.S.! VLJM-30046 - Mind Zero. VLJS-05008 - Eiyuu Densetsu Zero no Kiseki Evolution. VLJM-35259 - Steins Gate Zero. The previous owner took incredibly good care of their collection, but tossed the boxes to save space in college. PS VITA LOT OF 2 Rayman Origins Angry Birds Star Wars . Condition is Like New. Shipped with USPS First Class Package. Games only no Plastic cases. Deception IV: Blood Ties. Conception II: Children of the Seven Stars. Lot includes game cases and game. Mod nation road trip, lego Batman 2, LEGO Chima lavals journey, lego Jurassic world, tearaway, and lego avengers. Exact games in pictures. Ps Vita Lot. Condition is Very Good. Shipped with USPS First Class Package. Condition: New and Factory Sealed. Lot of 3 PS VITA Games Senran Kagura Shinovi Versus Japan, Shinobido 2, Genkai Totsuki Moero Chronicle. -You will get all 3 games pictured. Lot of 3 PS Vita Games The Legend of Heroes Zero no Kiseki , Sen No Kiseki, Ragnarok Oddisey. -You will get all 3 games pictured. Latest Version 3.0, support up to 256GB Micro SD card. LEGO Batman 3 Beyond Gotham. LEGO Batman 2 DC Super Heroes. Your mission is the guidance of the four princesses belonging to each power. How do you teach and guide?. Which princess' fight will you see?. What kind of ending is waiting?. Everything depends on your choice. Nintendo 3ds Legend of Legacy Special Edition. 2x Nintendo 3ds Pokémon Rumble Blast. Nintendo 3ds Yoshis Woolly World. Nintendo 3ds Yoshis new Island. Nintendo 3ds XL blue. Has screen protector. Scratches on case. Hunting Bird sound Decoy. Hunting Accessories. Bag & Pouches. Latest Version 3.0, support up to 256GB Micro SD card. Playing Mat. Oxygen Sensor. Turn Lights. Air Filter Adaptors. Do not attempt to repair item on your own. FOR SALE IS A.
AC-DC Convertor. Pet Grooming. Converter Module. Sensor Module. Latest Version 3.0, support up to 256GB Micro SD card. Training & Obedience. DIY Scrapbooking & Paper Craft. Aquarium & Pet Supplies.